Close-Up Film caught up with Naji Abu Nowar, director of the recently released Theeb (translating to ‘Wolf’), to discuss some of the difficulties in making a film steeped so heavily in culture, discussing the more universal life lessons to be learned from his debut film and ideas for his next feature. Theeb, set in 1916, is the story of misadventure of a young Bedouin boy who makes a perilous journey across the vast Desert in an attempt to guide a British Officer to a secret destination. A coming-of-age tale of strength and perseverance, will Theeb live up to his name? Well it was a long process. I loved the way [Akira] Kurosawa adapted the Seventh Samurai  films, the John Ford Westerns etc., and I wanted to do something with Bedouin culture. The first thing I tried to write was a really bad remake of a Leone Western and I took me 10 years to getter better at the art of writing. A friend of mine brought me a short film script about two Bedouin boys (on a hunting trip that does wrong) which was to me a character drama and that really gave me my way in. But really the film comes from living with the Bedouin and their poetry and storytelling. The lead character was a little boy. Was this pre-decided, or did this just develop out of the storytelling? We were living there for a couple of months and gaining the trust of the tribe, studying the culture as well as other things and we needed to raise money. We started a mood board [not to dissimilar to Kick-Starter] so we talked to the Bedouin prpducer and asked for him to find some 12-13 YO Bedouin boys in order to start a sort of campaign to raise money. He’s a lazy guy who just send his son. The actual actor [Jacir] I never actually like as an actor as he was so shy and quiet and I never considered him, but he has this crazy thing that when you put him on camera he a different person. Immediately it became obvious. And so he was the first person we cast and we never looked back or at anyone else. And the actor playing his brother? We went around many villages doing casting meetings. It is difficult to have casting meetings because to reject someone in Bedouin culture is considered very rude. So we just had taped meetings where we talked to people and we selected 20 from those. Then did a weekend of acting workshops and selected 11 from those and then those 11 became our acting troop which we worked with for eight months. So Hussein [who plays Hussein, Theeb’s brother in the film] is actually a cousin of Jacir’s and the thing I really liked about them is that they have a natural brotherly relationship that is totally naturally for them. So I though that all we have to do is capture that on camera and we would be fine. For myself it was a film of two halves. I think [Theeb] he is story of a young boy in a very difficult dilemma. He doesn’t yet have the knowledge of how to survive in the desert and so his remains very reliant on the stranger. At the same time perhaps his still retains these very murderous intentions because, lets face it, he has killed his brother and I think as he progresses he develops a fondness for the stranger, in a fatherly way. Then to mind comes Stockholm syndrome and these types of conditions. And so it is a culture of those ambiguous emotions that just gets snapped with the stranger calling him his son and the fact that the brother has been murdered for nothing more then money. I think it is that which triggers the change in Theeb. For myself, the film almost plays out on ‘one large battleground’. Everyone is fighting against each other. After doing some research I found out the film was set during WW1 and so I was wondering was there a reason why it was set at such a pivotal moment in history in terms of Middle Eastern history. So would you then say the film is a comment on the current socio-political events, a reflection maybe? At the time we didn’t know the Arab Spring would happen. I wish I could say we predicted it. But I say I believe it was in the zeitgeist. It was something we were all feeling. That is what drew us to that moment in time. In so many Western for example there remains such political commentary, for example The Good the Bad and the Ugly [Sergio Leone, 1968] and its links to the American Civil War. I like to set drama’s in moments of monumental change. Speaking of westerns, after watching the film I did see where you are coming from in terms of [visually] resembling a western, with the towering backdrops and the natural desert structures. I found out that Theeb was filmed in a similar locale to Lawrence of Arabia [David Lean, 1962]. Did you want a similar aesthetic, or is this just a coincidence? No. Any similarities ends with the fact that it is set in the same period. It wasn’t really a reference for the film, it more the fact that we set it in the same period, for this period is important in Middle Eastern history. Perhaps what would interest me more is Ryan’s Daughter [David Lean, 1970] in that the English officer in the film I really liked. So I would say that is there was an influence it would more so be the influence of some of the aspects from Ryan’ s Daughter rather than Lawrence of Arabia. 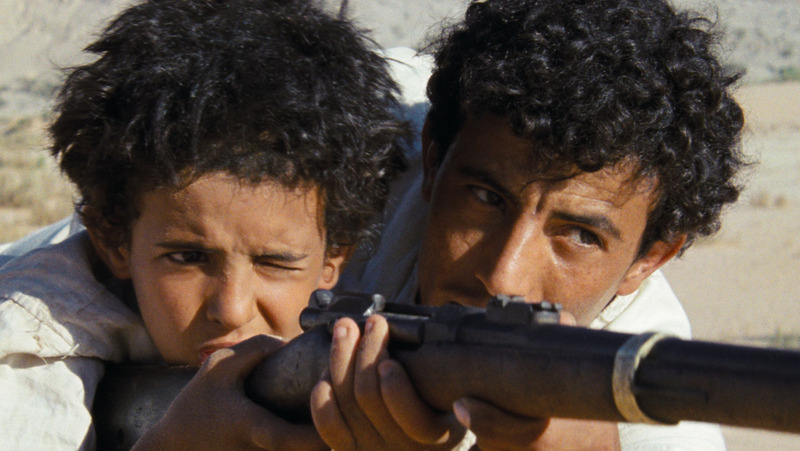 Moving on slightly, Theeb was your debut feature. Was it a hard process and do you plan to do it again? I absolutely loved the experience! Obviously the key thing to remember is to every film you have to learn from because you are never going to have all he knowledge. Your never going to be experienced or wise enough. You have to do you best to acquire all the skills and information needed to make the film, but sooner or later you just have to make it. So, in a way I was blessed by my ignorance. I didn’t think about the fact that I was working with amateur actors or animals and kids and all these things. I didn’t know any better so I just did it and I am all the better for it. Its all just about trying to improve your knowledge to grow and get better. Are you planning anything new that you can reveal to C-UF exclusively? As of right now I am developing a number of new projects, and once I have finished all of my obligations on Theeb I will get back to work and hopefully make another one. Hmmmm, well that depends. There are a few different films that I am developing. One of them is almost a sequel of sorts, my version of the Seventh Samurai [Akira Kurosawa, 1954] which would be an action war film set in the 1920s directly leading on from Theeb. Another one I have is completely different. Moving on now, the film’s title! I tried to define it and came up with a modern translation meaning ‘Wolf’. Would that be a correct translation? Good because at one point that is a quote within the film that says ‘The wolf begets a wolf’. Was that quote then a reference to the character of Theeb or a general reflection of all the characters due to the general fighting that takes place throughout the film? So the quote ‘The wolf begets only a wolf’ is actually a [double] gesture of respect. So if I say that to you, I am respecting you by calling you a wolf, and calling your father a wolf at the same time. So in the film Theeb has a famous father in Bedouin culture and so when the stranger discovers who he is the story significantly changes. Now he [Theeb] is in trouble. Now he has a potential blood feud with one of the biggest tribes in the region. And so the stranger quickly endears himself to Theeb by acknowledging his father is a wolf, and it’s all a part of this coercion he is doing to psychologically control him. Also, I wanted to bring up the water well sequences. Of all the film, for me this was one of the most powerful sequences. Was that planned because it seemed almost very out of the blue in a narrative that throughout does follow a similar trend. Well, going back to what we were discussing when talking about the ‘Circumcision Ceremony’, water wells are a very important part of this process. For example, a lot of the challenges that the young males have to go through are centred on such wells. Usually it involves sending a boy out late at night to retrieve the weight stone in the water bucket. Very rare and distinctive stones, they can’t be mistaken. Naturally you have a lot of stories about people falling down wells and I almost drowned as a child and that scene is very much inspired by my experience as a child and that was how it felt to me to nearly drown. It was centred on that. Well in the spectrum of the film the water well remained very important. They were viewed almost as checkpoints on the journey with the British Officer. Would you say this is the case? Yes! They were all have different kinds of appearances and themes and the idea that this ancient Roman well that has been man-made by another civilisation, who have now been conquered (which must have been a massive tumultuous period). Then the pilgrimages in which they represent a very naturalist structure I always saw it as a point of rebirth and there is for me a vaginal aspect to the water wells. Especially in the way in which Theeb’s character remerges from it. Then there is the well at the fort. However this water well is not as obvious as others depicted in the film in that it’s different; a large metal, modern, cranking winding water well which really brings to light the changes brought about by modernity. Yes, it was very much still part of the fictional story moving through a historical fabric that is a part of the real history. Therefore this railroad plays a huge part on the Bedouin ways of life, on key military decisions made, and of course the attempt of the Ottoman empire to retain control of their territories. So the railroads are a huge part of it in that they changed everything. Yes, definitely. As death permeates the film – it can be seen everywhere, constantly – in a good way I think. You provided very powerful images of death. I will always remember the flies in the film [crawling in to the eyes and noses of men both dead and alive], and I felt that it was a good, genuine aesthetic that contrasted very well with the tone of the film. It felt very natural and although there were inevitable twists within the plot [as any good film should have] there was nothing overly artificial or fabricated, and it all just felt very real to me. So what I guess I am trying to ask is if that was the aesthetic you always aimed for? So as you said before, the Bedouin tales and stories inspired the film, have they seen the film? So three of the actors have seen the film. I got them their first passports and it was the first time they flew on a plane and they went to Venice [for the film festival, where the film won the Orizzonti Award for Best Director. It was a big difference from the desert to Venice. And it was a real shock to them. I t was also the fist time they had been to a cinema so that was an amazing experience for them. Then after being at the premiere, we also did a screening in the desert and we invited al the tribe to come and watch the film outside, under the stars, and it was an amazing experience and again it was the first time they has saw a big screen and that was a very special moment. I was very relieved that they were happy and proud of the film. And winning the Orizzonti Award at the Film Festival. How was that for you? Though the most special moment was at the premiere because we were all together and they [audiences] gave us a standing ovation and that was really amazing, For the Bedouin and to see their faces as people applauded them for 10 minutes it doesn’t get any better then that. I don’t think I will ever have an experience like that again! So it was a once in a lifetime experience and I am very luck and happy that my first experience turned out the way it did. Going back slightly on what we said before, one of my favourite shots was the image of the night sky which I absolutely loved! Was this a scene that was pre-planned or did you take an opportunity one night to go out and photograph the sky as it is a very beautiful sequence. And even more so its placement within the film is perfect in that for the majority of the film it is daytime and everything feels and looks so hot and it was just really well placed and just stood out for me in the film as a whole. I had studies a lot of day-for-night scenes, and a lot of them were studied in the desert. And what I realised was that naturally the sand reflect the light form the sun in the day which creates a bluely tone to these films. So what we did is we looked for a stretch of desert which was covered by Black Basalt Salt (which you have in Jordan) which takes in less reflection from the sunlight. Then, in that day-for-night scene we were abbe to get the correct sorts of tones that we can map out the sky line and replace it was this very vivid image of the starry night sky. So that is how we were able to achieve that. I really wanted to try as much as possible to create the feeling of experience that because it is a very wonderful experience to travel and look up at the sky and star and they are so clear and unobstructed. You get such an incredible, mindboggling view and I am glad we were able to create that. Everything about the experience was worthwhile and I am excited for what comes next.